A common species of damp ground on upper sea shores, ditches or marshy ground near the coast; also about Lough Neagh and Lough Erne areas; otherwise rare inland. 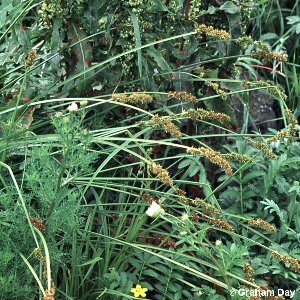 All names: Carex otrubae Podp. ; Carex cuprina Nendtv. ; Carex vulpina auct.